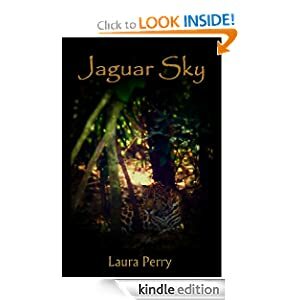 This week's guest blog is by Laura Perry, published author of several non-fiction books, here to talk about her new novel, JAGUAR SKY. Building a World: What’s Really Real? Building a city or even a planet in a SIMS game is one thing; creating a fictional world in which your novel’s characters live and breathe is another. And setting your fictional world in the present day adds all sorts of entanglements you must pick through before you can safely write your story. If you think the word ‘safely’ implies some sort of danger you must avoid, you’re right. First, let’s look at one particular type of world-building that turns out to be a little less difficult. Historical fiction has long been one of my favorite genres. I have often admired the way writers from Alexandre Dumas and Umberto Eco to Mary Renault and Jean Auel provide an intimate view of a world that no longer exists. They researched the history (or prehistory) as accurately as possible, but as writers of fiction they were allowed to fill in the blanks however they cared to. You may agree or disagree with their choices for tying together the threads of ‘official history’ with the strands of a fictional story, but these writers have a great deal of freedom. As long as the made-up part of their story fits in with what the historians tell us, they’re good to go. No one is going to sue them for defamation; their readers will sink into the novel’s half-real, half-made-up world without a fight. But what if you’re writing a work set in the present day? I’m not talking about fantasy or science fiction here, but stories that depict fictional characters in real-world settings. How do you dovetail the made-up parts with the factual ones? How much reality can you insert into your story without treading on the toes of real-world people and institutions? How much can you make up and still have your reader believe in your world? That’s a fine balance. Let me give you an example. When I began writing Jaguar Sky, I knew I wanted the main character to attend an existing university and explore an actual archaeological site in Central America. But as I began writing, I realized I was going to have some problems if I got ‘too real’ with my story. The main character in Jaguar Sky, Maddie Phoenix, is a sophomore at the University of Florida majoring in anthropology/archaeology. She attends a real university, lives in a dorm that actually exists and takes classes from a department whose offices I have visited. Though I was already familiar with the university campus from childhood as well as from my time with a college boyfriend who attended UF, I made a special trip to Gainesville to take photos and note details of the places where Maddie lived, worked and hung out. I wanted to get even the small things right so my readers who had never been there would feel like they were walking across campus right alongside Maddie and those who were already familiar with the university would still buy in to my story. To me, there are few things as disconcerting as reading a novel set in a location I know well and coming upon inaccurate descriptions of the setting. This tells me the writer wasn’t willing to put forth the effort to get it right. If we’re collecting up a set of rules about world-building, the first one is this: Do your research. Don’t guess. Don’t make it up. At the very least, check out your story’s location online or at the library. Explore it through Google Maps and Google Earth. Talk to people who have been there. If you can, go there yourself. Having your feet on the ground in the places your characters will walk gives you a unique perspective and a powerful set of information from which to build your story. During the process of writing Jaguar Sky I hit the first roadblock when some of my characters, professors from the Anthropology Department, turned out to be a bit unsavory. Though they weren’t really ‘bad guys’ in the traditional sense, they definitely wouldn’t add to the reputation of any university and no real academic would want to be associated with them (and I refuse to comment on whether my own experiences in academia inspired any of them). I didn’t want to publish the book and end up with the UF legal department sending me nasty letters, so I chose not to include any living people from the university in my novel. The buildings are real; the department offices look exactly the way I describe them in the book. But every single one of the professors in the novel is a fictional construct. That way, I could have them act however I wanted without stepping on anyone’s toes. Add World-Building Rule Number Two to our list: Don’t include living people in your work without their permission. And even if you have their permission, proceed very carefully. People have been known to change their mind and become offended, even enraged, later on. I continued following these two rules as I moved the action in my story from Gainesville, Florida to Belize, Central America. The locations the characters visit are all real – the Hotel Belmopan, the Fort Street Guest House and El Centro restaurants, the ancient Maya site of Lamanai and its surrounding environs. I have visited these places myself; in fact, it was a trip to Belize to view the Maya ruins that inspired the novel. I even experienced the same boat ride from Orange Walk to Lamanai that my characters undertake. I used my photos and notes from the trip to reconstruct the details of the places Maddie and her companions visit and I looked up bits I couldn’t remember clearly. No matter where your story is set, you’re taking the reader on a trip there, so make it real. Your characters’ activities and skills need to be real, too. Maddie and her department’s team spent more than a week working at an archaeological dig site in Belize. I’ve never done any archaeology work (one college course more years ago than I care to admit doesn’t count) so I had to turn to experts for details about how that sort of thing works. Sure, I could have picked up a book or two about archaeological methods, but I have found that talking with people who do these things themselves is a far more fruitful use of my time. Most people are happy to chat with you about how they do their jobs, what kind of skills and equipment are involved and what pitfalls a person in their field will likely run into. This is another way to make your fictional world real: research the activities as well as the location. Check with an expert and don’t believe what you have read in other works of fiction, no matter how popular they may be. The one part of Jaguar Sky I chose not to make real, however, was the people. While I did describe employees at real hotels and restaurants as well as archaeological site officials and local law enforcement, I was careful not to use any names associated with those places in real life, especially since some of the characters were not particularly pleasant. It’s amazing how easy it is to accidentally give a character a name that coincides with that of a living individual, especially if you’re aiming to provide a certain flavor or meaning through the names. Some of the character names in Jaguar Sky needed to be Central American Hispanic or Maya, and since I was unfamiliar with the variety of names of those types, for practical purposes I had a limited pool to choose from. So before I completed the novel I looked up the names of business owners and various officials to make sure I didn’t accidentally call a character a name that could be misconstrued. I was lucky; I only had to change one name to be safe. But I went to some effort to make sure the characters all had names that were believable for their background and geographic region. Another world-building rule: Include names in your research. Just as readers are not likely to believe in a character named John Smith (unless you’ve chosen that name for humorous purposes) they’re not likely to believe in characters whose names don’t match up with the individual’s back story. I ran into the character-naming issue with my next novel, which is not yet published. It is set in the north Georgia mountains so the characters had to have names appropriate to that subculture. But I didn’t want to anger or offend any of the people who live in that area; I’m hoping many of them will read the novel, and I do love those mountains and their culture. After some debate, I ended up taking two steps to ensure that the world I created for this novel was realistic while still safeguarding myself. First, I got in touch with someone I knew who lived in my story’s location and tossed some first and last names around with him. I wanted to be sure the characters were believable as locals, given their names. But I also wanted to make sure I didn’t use any last names that coincided with prominent families in the area. It only took one conversation to collect a list of safe-but-flavorful names for my story. My second step came after some deliberation. One of the difficulties with creating a realistic world in fiction is that it must feel genuine to the reader while still serving your purposes in the story. For instance, if the layout of Baton Rouge works well for the action in your story, then use it. If it doesn’t fit, you may need to invent a fictional city that gives your characters the freedom to follow your chosen plotline. That’s what I ended up doing. I created a fictional county in north Georgia and inserted it between two existing counties. Yes, I stretched the map and warped the fabric of space/time, but Mathis County is exactly what I needed. It has farms, towns and mountains in the right locations; it is the correct distance from Atlanta; its Sheriff’s Department has exactly the staff and the interpersonal issues necessary to move my story forward. Ultimately, the process of world-building is one of compromise and balance. If you take the time to research the details, your fictional setting will be believable. If you make the effort to avoid catching up living people in your plot, your fictional world will wend its way safely into print (or pixels). The question to ask yourself, then, is this: If I were the reader, would I believe it?